Play with color to create subtle gradations like this flow from ruby red to electric purple to cornflower blue and back again. 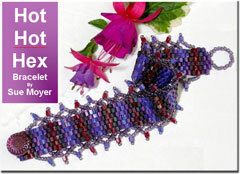 Your bracelet could blend red-orange-yellow or blue-aqua-green. Great Beginner Peyote Project.